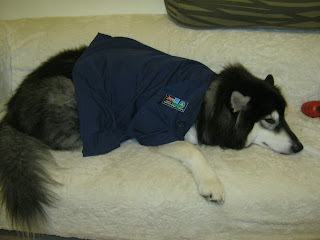 If you refer to the "About Me" section on this blog, you'll probably find mention of my Alaskan Malamute. His name is Shadow, and he is AWESOME. Yeah, most pet owners say their dog is awesome, but mine is. For seriously. 1.) He is taller than me when he stands up. We can dance if we want to...(we can leave our friends behind...) I am a safety professional by trade, and The Safety Dance song (linked above) is one of my fav goofy songs. 2.) He is an adept sponge, dish towel, hot pad, and food stealer. But when I give him my evil eye/glare, he runs outside and drops it in the mud for me to retrieve. 3.) He makes friends with everyone and everything that isn't a Rottweiler. All his lady friends at Camp Bow Wow and the staff there say he is quite a charmer. 4.) He has forced me to go out and met my neighbors and be all social on our daily walkabouts. 5.) He lets us sit on his couch from time to time. This is what my husband brought home. SUPER CUTE. Now that he has entered his teenage years, he's depressed and hates his job so much that he lays on his couch and cries. I'm just kidding - he doesn't have a job. :) He's completely spoiled. We dressed him up as a pharmacy technician to see how well he fit into husband's clothes. Sometimes we're weird people. Our dog has his own Ikea couch. Enough said.